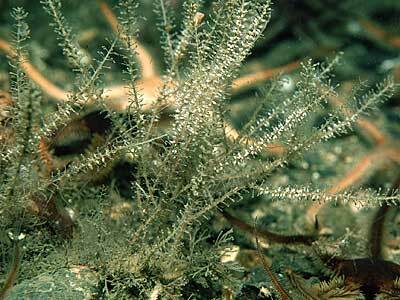 Description: The main stems and side branches of this hydroid are erect and composed of several fibres. The hydrothecae are are arranged on long slender stalks, there are 5-6 rings at the top and the bottom of the stalk. The hydrothecae are bell-shaped with several even blunt cusps on the rim. The gonothecae are flask-shaped and are arranged on short ringed stalks. Habitat: This is a typical species of scoured habitats with mobile sand and gravel. It is normally attached to shells and cobbles, but may also occur on boulders and bedrock subject to strong tidal streams and turbid water conditions. Distribution: Widespread in the British Isles. Similar Species: The whorled arrangement of the hydrothecae on unbranched stems is very characteristic of this species. Picton, B.E. & Morrow, C.C. (2016). Rhizocaulus verticillatus (Linnaeus, 1758). [In] Encyclopedia of Marine Life of Britain and Ireland.